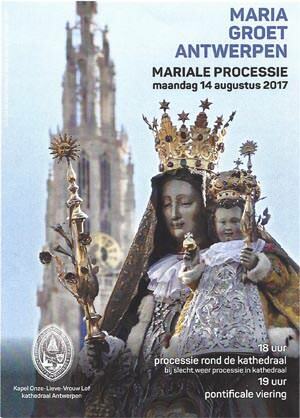 Next Monday and Tuesday, August 14 and 15, the (Roman Catholic) diocese of Antwerp celebrates the Assumption of the Blessed Virgin Mary, its patron. The celebrations will start on Monday at 18:00 with a procession, in which the statue of Virgin and Child will be carried around the perimeter of the cathedral. In the event of poor weather, the procession will be inside the cathedral. [Hint to young residents of Antwerp: don’t forget that Tuesday is also Antwerp’s mothers’ day!]. Weekday Eucharists and special services are to be found in our Calendar. Arrangements for baptisms, weddings, funerals and confessions to be made with the chaplain. This website is maintained by Friends of St Boniface Anglican Church vzw.